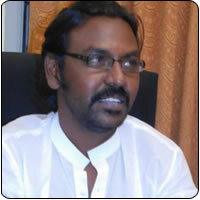 Actor Lawrence says that he is working on a project titled Kanchana. Adding further, the actor said that it will be the second part of Muni, but is definitely not a continuation to it. Speaking of Kanchana, Lawrence says that Anushka will play the title role. He asserts that her role will be quite similar to that of Raj Kiran’s in Muni. Though Anushka has been signed up, Lawrence will have a Mumbai-based model playing his pair. Lawrence declares that he will remake the film in Telugu too.